Strawberry shortcake is such a summery dessert. 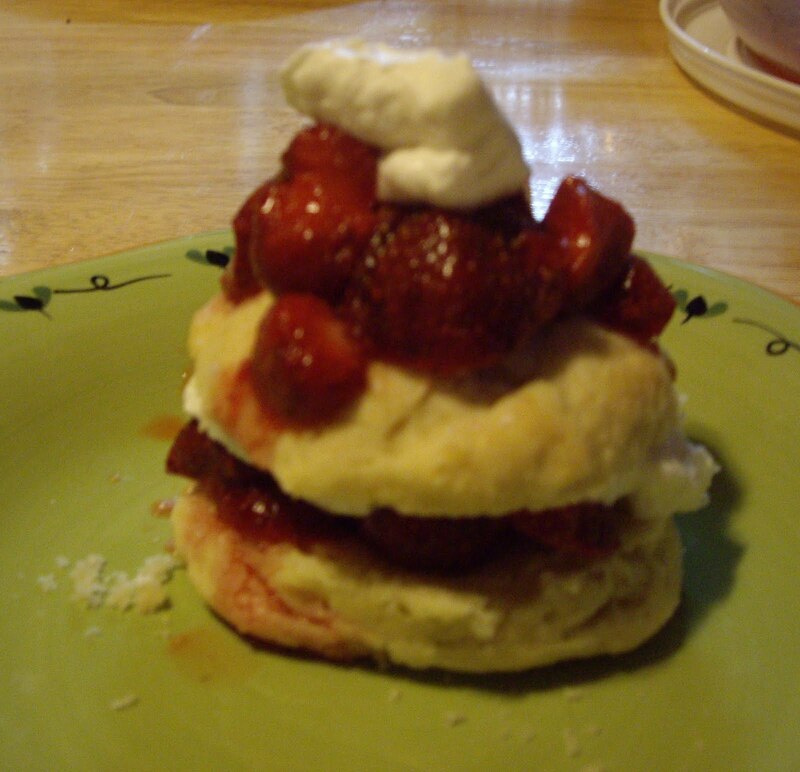 You can make one big shortcake and serve it in pieces, but I like doing the individual shortcakes. Kids love having their very own shortcake and you can make them as you need. Preheat your oven to 450 degrees Fahrenheit. You will need an ungreased baking sheet. Mix the strawberries and the 1/4 sugar. Set off to the side. In another bowl mix the flour, baking powder, and 1/4 cup sugar. Add the egg and the milk at once. Turn dough out onto well floured surface. Knead gently until dough is not sticky and workable- about a minute. Pat dough to about a 1/2″ thick. With a 2-1/2″-3″ biscuit cutter cut out 6-7 shortcakes. Put on the baking sheet. Bake for 12-15 minutes. At 12 minutes do the toothpick test. Toothpick should come out clean. Remove shortcakes to wire rack to cool slightly. Spoon some strawberries onto bottom half. Top with dollop of whipped cream. Add top half of shortcake. Add dollop of whipped cream. Makes 6 or 7 shortcakes. Instead of kneading dough, spread it into a greased 8″ round pan. Bake for 15-18 minutes and do the toothpick test to make sure it’s done. Split cake into 2 layers and add half the strawberries and cream. Add top layer and rest of strawberries and cream.